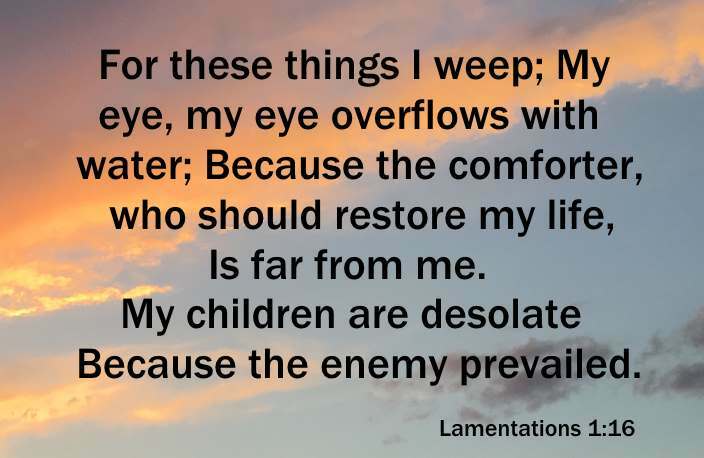 For these things I weep; my eyes flow with tears; for a comforter is far from me, one to revive my spirit; my children are desolate, for the enemy has prevailed (Lamentations 1:16 NKJV). Her oppressors have become her masters, and her enemies prosper, for the Lord has punished Jerusalem for her many sins. Her children have been captured and taken away to distant lands (Lamentations 1:5 NLT). The faithful love of the Lord never ends! His mercies never cease. Great is his faithfulness; his mercies begin afresh each morning. I say to myself, The Lord is my inheritance; therefore, I will hope in him!” The Lord is good to those who depend on him, to those who search for him. So it is good to wait quietly for salvation from the Lord (Lamentations 3:22-26 NLT). God was faithful! Jerusalem's weeping was rewarded. Daniel repented on behalf of the nation (Daniel 9:15-19) and God restored them to Jerusalem in approximately 536 BC (see Daniel's Prayer). 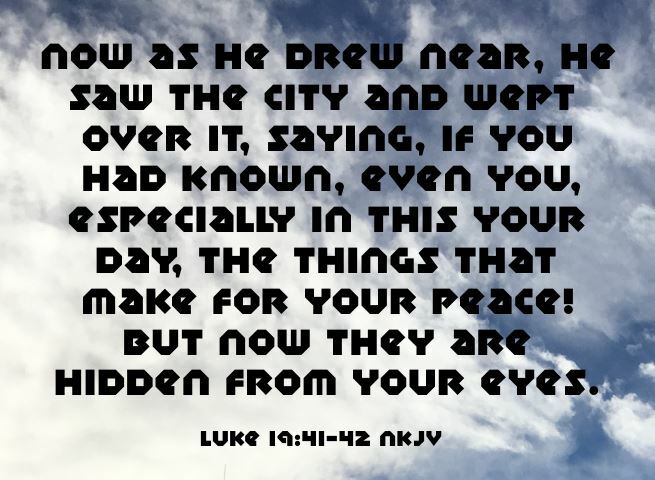 Now as He drew near, He saw the city and wept over it, saying, If you had known, even you, especially in this your day, the things that make for your peace! But now they are hidden from your eyes (Luke 19:41-42 NKJV). So why did Jesus weep over Jerusalem? He knew they would not fully receive and respond to the new covenant. He knew they would not embrace Him and what was to come, but instead they would reject and crucify Him. Fortunately for us (Gentiles) He did die on the cross, He was buried and He rose again, giving us the Gospel of Jesus Christ to obey. For godly sorrow produces repentance leading to salvation, not to be regretted; but the sorrow of the world produces death (2 Corinthians 7:10 NKJV). And Peter went out, and wept bitterly (Luke 22:62 ). If you have never shed a tear over your sins and have never been filled with the Holy Ghost, speaking in tongues as the Spirit gives utterance (Acts 2:4), ask yourself if you are really repenting and are really submitting your life to Jesus Christ. One cannot receive the gift of the Holy Ghost without repentance. We may fool ourselves into believing that we have repented but it is impossible to fool God. Weep or weep not? 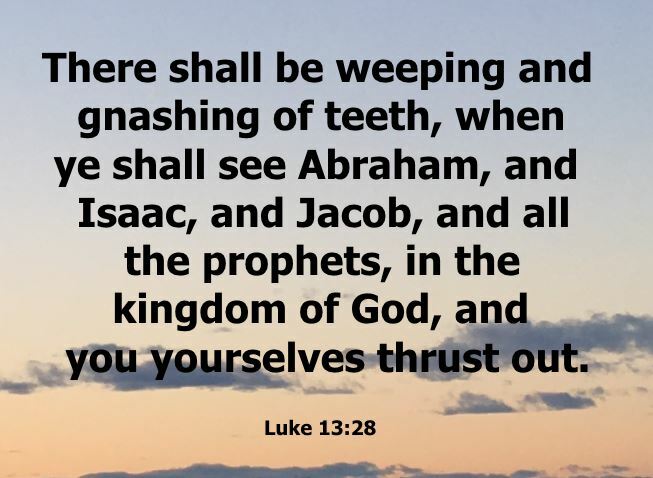 There is no doubt that if Jesus wept over the Jews (and still is today), and that He is certainly weeping over Gentiles that do not obey the Gospel. The world population today is about 7.7 billion. Based on 2011 worldwide population and mortality rate, 55,000,000 people die each year. God has given every human being a measure of faith (Romans 12:3) which allows every person since the day of Pentecost (Acts 2:1) to be saved. Having said that though, approximately two-thirds of the world population do not even profess to be Christian, which means that in 2011 "at least" 37,000,000 lost souls died and did not go to heaven. Weep or weep not? The word Trinity is not in the Bible, never mind Holy Trinity. Trinitarian doctrine was accepted at the Nicaea Council in 325 AD. It is not Biblical! Of course, Trinitarians baptize in the name of Father, Son and Holy Ghost, not understanding that the "name", is in fact, Jesus Christ. How could have Peter and the ten disciples misunderstand what Jesus said the day of the Great Commission (Matthew 28:19) when approximately ten days later on the day of Pentecost, Peter preached "baptism every one of you in the name of Jesus Christ for the remission of sins" (Acts 2:38) and not one of the other disciples spoke up and said Peter was wrong? For more on the truth about baptism go here. Acts 4:12 says "Neither is there salvation in any other: for there is none other name under heaven given among men, whereby we must be saved" so how could it be possible to use the titles, Father, Son and Holy Ghost when baptizing the repentant sinner and begin to believe that there sins will be remitted. The word baptize in the Greek means to immerse, submerge but Catholics sprinkle or pour water on the baptismal candidates. They baptize infants who have never spoken a single word, never mind having repented of their sins. They believe when you are baptized, you automatically receive the gift of the Holy Ghost at the same time you were baptized. Acts 2, 8, 10 and 19 categorically show that baptism and infilling of the Holy Ghost are separate events. They believe that you will NOT speak in other tongues as the Spirit gives utterance when you receive the gift of the Holy Ghost (Acts 2:4) but that fact is clearly evidenced in Acts 2:1-47, 10:1-48 and 19:1-7. Jesus also says that believers will speak with new tongues (Mark 16:17). They don't have the knowledge, understanding and wisdom that "Jesus is God". As you see above, I did not discuss other Catholic Sacraments. I did this on purpose because most of the Protestants in the world believe and practice exactly the same thing as the Catholics, i.e. without the other Sacraments. That means we can add approximately another two billion "Christians" to the list of those that don't profess to be Christian, meaning that in 2011 there were approximate 51,000,000 unsaved souls that died. Weep or weep not? Our choice: Weep or weep not? Train up a child in the way he should go, And when he is old he will not depart from it (Proverbs 22:6 NKJV). You shall teach them to your children, speaking of them when you sit in your house, when you walk by the way, when you lie down, and when you rise up (Deuteronomy 11:19 NKJV).